Exciting Announcements were made for Sebastian Solano this past week. The article below was published in New Times Miami on 1/1/15! “We’re a brand that’s growing from the bottom up,” the Life in Color crew told Crossfadeback in 2013, just days before the first-ever LIC Festival was set to splatter neon paint across the Magic City. Almost two years later, this prophetic vision for the LIC brand is becoming a reality. And now co-founder Sebastian Solano has even been named one of Forbes‘ 30 Under 30 in Music for 2015. Forbes may be recognizing Solano as la crÃ¨me de la crÃ¨me in the music biz this year, but Life in Color’s success has been in the works for nearly a decade.The only Miamian to make the cut, Solano is joined by up-and-coming pop stars FKA Twigs, Charlie XCX, and Chance the Rapper, as well as Revolt TV’s Kai Wright and Nas’ manager, Anthony Saleh, among others. 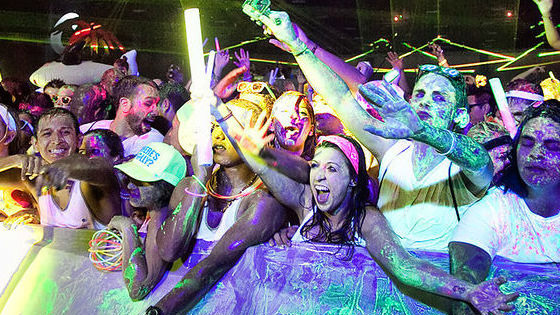 Formerly known as Dayglow, “the world’s largest paint party” began in 2007 when a couple of college dudes from Florida State University noticed a growing, yet unorganized trend of paint parties hosted by frat houses and sororities. That in mind, Solano and his buddies threw their first major 1,000-person neon bash at downtown Miami’s Mecca. A hit, the guys soon found themselves putting on Dayglow events in cities across the state. In 2010, the paint fest crossed the border to Mexico for it’s first international rager in Cancun during Spring Break. With a now solid rep, Solano and his party crew put on a total of 65 U.S. shows in the spring, and another 65 shows in the fall of the following year. Then in 2012, Life In Color was purchased by Robert F.X. Sillerman, who connected LIC with dance music powerhouse ID&T, the entity behind the Sensation Tour, a move that’s allowed the fest to expand exponentially. From throwing EDM paint parties for college students to filling up stadiums across the globe, Life In Color has attracted the likes of Steve Aoki, Calvin Harris, Kaskade, and other mega DJs, bringing Cirque-du-Soleil-style acrobatics, and, well, tons of neon to thousands. In fact, LIC has left 600,000 people in over 55 countries oozing in paint.